Born in Japan, Mitski grew up surrounded by her father's Smithsonian folk recordings and mother's 1970s Japanese pop CDs in a family that moved frequently: she spent stints in the Democratic Republic of Congo, Malaysia, China and Turkey among other countries before coming to New York to study composition at SUNY Purchase. In terms of message though, the 25-year-old cuts the same defiant, feminist figure on Puberty 2, her most recent album, that won her acclaim last time around (her hero is MIA, for her politics as much as her music). On the heels of their first national U.S. tour with Stick Figure and Fortunate Youth, one of Jamaica’s most promising young acts Raging Fyah is gearing up for their debut album for Dub Rockers, entitled Everlasting. The five-piece Kingston collective – consisting of Kumar Bent (lead singer), Courtland White (guitarist) Anthony Watson (drummer), Demar Gayle (keyboardist) and Delroy “Pele” Hamilton (bassist) – carries the tradition of the island’s enduring roots rock reggae spirit with an expansive vision and fresh contemporary flare. While their palette has expanded over the years to touch upon hip-shakin’ classic rock, soulful country ballads, and golden oldies pop, their primary attack strategy still relies heavily on the jagged hooks and boisterous choruses of their formative years. Their fifth album Nosebleed Weekend retains all the devil-may-care magnetism and serrated instrumentation of their debut, but it flourishes with a decade’s worth of songwriting discipline and chemistry. 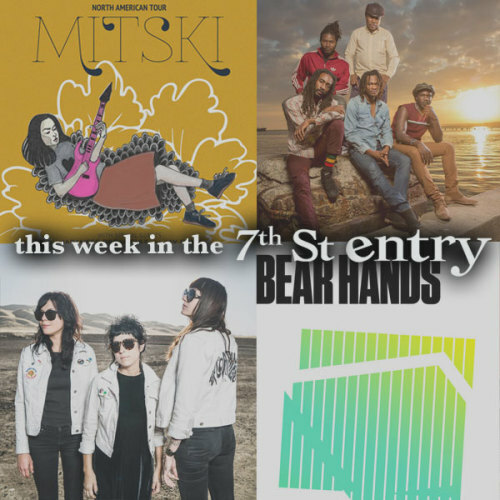 In an age where Instagram and YouTube clips dominate the ways in which fans consume music, Bear Hands have reached for something more traditional. With their third album You’ll Pay for This, they’ve crafted a record that holds the listener in its grip from start to finish. You’ll Pay for This is a potent mix of sticky 70’s songwriting, CBGB’s and Factory Records era post-punk guitars, and the high drive of modern pop and hip hop. Their upcoming mixtape, coyly titled The Album, was produced entirely by Spencer Joles. It blends deceptive party tracks like “Smoke Daht” with the incise, razor sharp social commentary on “Chinatown Dreams” or “Fallen Souls,” which also features P.O.S. Both Spencer and Cunningham rap with a style that pushes forward while the other pulls back, complementing one another’s lyrical flow as each song mounts in rising tension. Ced Linus, born and raised in Virginia Beach, VA, is the co-owner of (and an artist on) Pledge Empire Records, a Minneapolis-based record label he started in 2007 with his brother Prince Carlton. Ced Linus has released three albums in total: The Dream Is Over (2009), Wings Of The Morning (2012), and Kings, Heroes and Streets (2013). Christ Like is Linus' latest album which has garnered press from City Pages.